This iconic “See Rock City” barn sign is on an old barn on a country road between Huntsville and Lima. Nine-hundred barns were painted with that slogan in 19 states. Fall is a great time to visit Rock City. 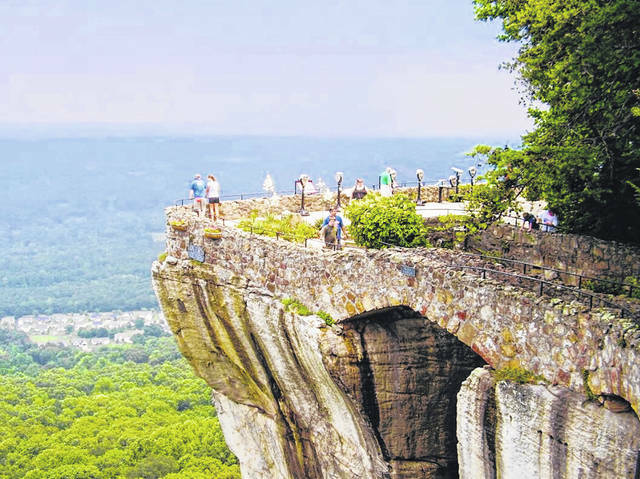 Take a road trip to Rock City at Lookout Mountain this fall. Rock City has been called the unofficial 8th Wonder of the World. Chattanooga, Tennessee. We’ve all seen the signs painted on the sides and tops of barns from Michigan to Florida. They say those three famous words: “See Rock City.” I even dug up one sign still remaining on the side of a barn northwest of Indian Lake during a recent Sunday road trip through the local countryside. In fact, there are over 900 barns that were painted with that slogan in 19 states from the Great Lakes to the Gulf Coast. Many still exist, but not many in Ohio. This is the only one I have ever seen in the Buckeye state and may be one of the only remaining in Ohio. You just can’t help be curious and wonder as to what and where this place is. Some think it doesn’t even exist and that it is just a myth, folk lore, country legend, or maybe even just a big hoax. This is clearly not the case. On the contrary, if you decide to follow the barn advertisements to Rock City, as I have done, you will find atop Lookout Mountain, in Chattanooga, Tennessee some of the most spectacular sights you will ever see. Some even describe Rock City as the eighth wonder of the world. And why not? This is a place like no other. It’s hard to describe this place, but if Disney where to create the world’s best interactive self guided walking path, on the edge of the earth with the greatest views in the world—this would be their place. I’ve actually never seen anyplace like this. The Rock City tourist attraction was started by owners Garnet Carter and his wife, Frieda, back in 1932. Garnet Carter, interestingly, was also the inventor of miniature golf. It has since grown to one of America’s top tourist attractions with over half a million visitors a year from all over the world. Rock City is a true marvel of nature featuring massive ancient rock formations, gardens with over 400 native plant species and breathtaking panoramic views of 7 states. Take the unforgettable journey along the “Enchanted Trail” where each step reveals natural beauty and wonder along the way. Experience the magic of Fairyland Caverns and Mother Goose Village, which features many unique and unforgettable displays of scenes from popular fairy tales. Cross the Swing-a–Long Bridge that spans nearly 200 feet across the edge of the earth offering thrilling views and heart pounding adventure. View the spectacular 100 foot waterfall and gigantic 1000 ton balanced rock. Walk over Sky Bridge and through Needles Eye. See Mushroom Rock and visit the White Fallow Deer Park and the Critter Classroom outdoor theater. The pinnacle point of the tour is the seven states lookout at Lovers Leap. Here atop the summit on the edge of the earth you will find one of the most breathtaking views in the world. See seven different states including Kentucky, Tennessee, Virginia, North Carolina, Georgia, Alabama and South Carolina. After finishing your tour, stop in one of the many cool gift shops at Rock City. “Rock City” is truly a one-of-a-kind place, like nothing you have ever seen before. 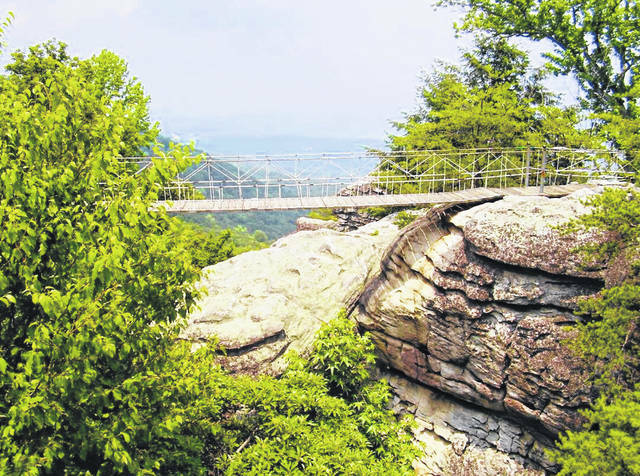 While atop Lookout Mountain there are several other don’t miss attractions to see. Ride the famous Incline Railway, called “America’s Most Amazing Mile.” The breathtaking grade of the track at 72.7% near the top, gives the incline the distinction of being the world’s steepest passenger railway. “Tourists are just amazed by how steep the track actually is,” says Christin Cadwell who works at the gift shop at the Incline Railway. The famous “Ruby Falls” is another don’t miss attraction atop of Lookout Mountain. Enjoy an entertaining and informative tour deep inside the caverns of Lookout Mountain and view the spectacular 145 ft underground waterfall. Be sure to also visit the Lookout Mountain Battlefield and Point Park where you will find many exhibits, monuments, hiking trails and scenic vistas. Upon leaving Lookout Mountain, be sure to tour downtown Chattanooga, voted one of the Top 10 Best Vacation Cities in America by Disney’s Family Fun Magazine. In this modern bustling city you will find one the America’s best aquariums, great museums, amusement parks, water parks, a great zoo, and one of the South’s best whitewater rafting outfitters. Visit the famous Chattanooga Choo-Choo. Ride the Cannon Ball roller coaster, visit the beautiful riverwalk area, and take in a riverboat cruise on the Tennessee River. Chattanooga will surprise you at every turn and it is home to many wonderful family attractions including of course the Eighth Wonder of the World- Rock City. Fall is a fantastic time to visit Rock City for the added bonus of viewing the Fall colors. With its panoramic and spectacular unobstructed views and vistas, it’s one of the best locations one can find to enjoy the changing colors of leaves that paint the local hills. The prime fall foliage season usually peaks in early November, so now is the time to start your Rock City Road Trip journey. 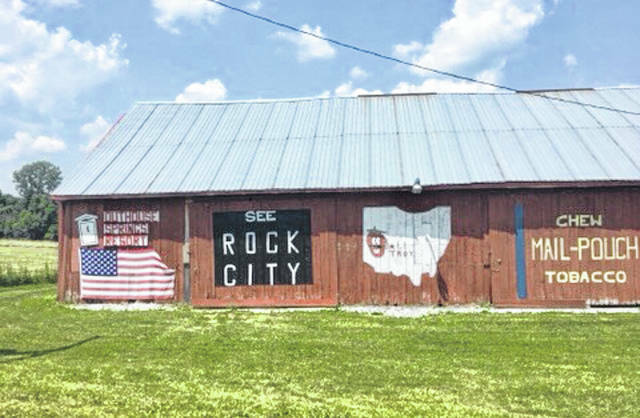 https://www.weeklycurrents.com/wp-content/uploads/sites/13/2018/10/web1_Rock1.jpgThis iconic “See Rock City” barn sign is on an old barn on a country road between Huntsville and Lima. Nine-hundred barns were painted with that slogan in 19 states. Fall is a great time to visit Rock City. https://www.weeklycurrents.com/wp-content/uploads/sites/13/2018/10/web1_Rock2.jpgTake a road trip to Rock City at Lookout Mountain this fall. Rock City has been called the unofficial 8th Wonder of the World.